I can’t begin to do justice to any detailed explanation of just what the heck the metaverse is. But this sort of limitation has never stopped me. I’m absolutely sparkling with energy whenever anyone mentions virtual worlds. We’ve had virtual worlds inside our heads since the evolution of the capacity for language. We live in worlds that we create in our heads. We build worlds from input from eyes, ears, interaction with others, and our own understanding of the world. It is that understanding that is so crucial to really “getting” the concept of virtual worlds. Just think about how a single bit of knowledge can shift everything in our “real world.” While I have many difficulties with the reasoning behind such actions in this example, I think most contemporary women in the western world can completely understand how the knowledge of an affair by a husband or life partner changes everything. Most women cannot view anything through the same lens once an affair is disclosed. Similarly the mind’s eye is shaped by our understanding of it. Knowing that our reality isn’t real, as in immutable, changes everything. A new world is evolving. The created world that each of us has in our head can not in the foreseeable future be shared, but mutual realities beyond what we share with our families and most intimate friends began in earnest with oral traditions that contained epic tales. This aspect of shared reality enjoyed another burst of punctuated evolution when fictionalized worlds created by writers climbed the various rungs of shared cultural fictions (drama – think Shakespeare, novels – think Dickens, broadcast media – radio, movies, television, internet.) And now we are coming into the another phase of internet media and one that very well may indicate a change in kind and not just quantity – one that allows vast communally development of ideas outside of the physical world. Single novels each created by thousands of people. Vast networks of women providing direct markets to other women and bypassing the male constrained economic and political systems that may limit their access traditional forms of capital resources and mobility but not their creativity and drive to innovation. I see organizations that work with global women’s concerns and I see non-profits that help women’s organizations, but most of these seem to mirror the male conceptualizations of hierarchy, corporate structure and hyper-territoriality. The history is defined a little awkwardly right now, and I'm not sure any of us has it in the place we need it to be. But I have you here in The Burrow to help me think it through, and I have all of Tucson rooting for something good to come out of this horror. I'm going to do my part. And I wonder, as did Mr. Obama last night, what you as citizens and parents are willing to do. If you don't mind, why not take a few minutes and give it some thought. Feel free to let me know in the comments if you want to make a public commitment to something. I know that it helps me to stay focused if I say it aloud. America is not going to get better unless we are all in it together again. Our President is asking us to join hands and take part. I'm throwing in my two cents, too........ let's do something..... Christina will never be able to fulfill her incredible potential..... it's on us now to do it for her. I am blogging here again and will continue to do so. Is that something? It is a start. And trying to stay as positive as possible is something. At least it will be for me when I look at topics such as those I wanted to be today's topic: Arizona as an example of what is to come if the slow, occasionally punctuated, evolution of social policy of the United States follows Arizona's example. The most conservative political factions in the country seem to be doing this. Shining the light of day into, the dark shadowy areas of how the non-wealthy are treated in Arizona which is a proving ground for uber States Rights funded by out of state and corporate sources will be focused on over the next few months. I will try to keep my barbed wit within tasteful limits in memory of little Christina murdered by a madman who has become symbol of a call for civility, but remaining civil will be difficult because of little 9 year old Brisenia Flores who, though she begged for her life, was slaughtered in her home by Arizona border militia, and all those poor Arizona children who will be denied either transplants or basic health care due to Brewer's death panels. This morning I read two blog posts by a Tucson blogger, a member of the BlogHer Network, and a survivor of recent shootings. Suzi Hileman, who writes The Burrow under the blogonym, Ashleigh Burroughs, is a new heroine of mine. She writes about walking through the vigil garden at UMC on Sunday evening with her husband, and by law enforcement. The garden was created for her and for the 19 others that were hurt or killed on January 8th. She writes with a grace and strength that I can only describe as exceptional. The first post of hers I read was written on Sunday. It was moving. The second was written on Monday and it is inspirational. It is as powerful of a piece of writing as I have read. That she is able to write just over a week after being shot multiple times by a madman is beyond amazing. Many folks, myself included, allow the bumps in life to disturb them more than is necessary. Our absolutely wimpy nature is made clear when we compare ourselves to this woman. First she has written consistently for two years and built up a following and received recognition for the quality of her blog in that time. That is an achievement. Now as a survivor of a shooting that was an attempt at a political assassination, as the woman who was holding hands with little girl, Christine Green, as she was murdered by the madman, as the wife of a man who spoke eloquently and rationally about a vile act of a disturbed mind, she speaks calmly and with a clarity of a person who is either being guided by the divine if that exists, or who somehow has a gift to be able to see hopeful, blossoming patterns of what might be and guide us to them through this maze of absurdity that is now. In the midst of all this, there is also the fact that her personal life now connects to her writing life. They were separate. I put the two together when I was looking at a list of survivors and victims and saw no Ashleigh there. Then I realized the wounds described by Ashleigh's daughter on the blog were the wounds described by the media as those of Suzi Hileman. On top of everything else inflicted upon her and stolen from her, her anonymity was gone, she had been outed. Fate saw fit to have the real woman behind the great blog emerge. We cannot know why. I hope she continues to blog, but it is not something that would be fair to ask of her. If she continues to blog, it will be a gift. There are such treasures of people all around us. People with gifts. Angels Unaware so to speak. I am adding Suzi to my list of comforts: places, thoughts, friends, readings, songs and poetry to which I can go, think, talk, read, listen when I need to find peace within myself. Genuine voice. Voice that takes me to a place in which I can find comfort. Real voices that know oh so much more than they ever wished to know. Voice from which I can learn. I also feel tremendous sadness for Suzi. As a person who has come to a point in life where she can give and speak from a point of wisdom, she is not to be envied. Wisdom gathers knowledge into us through sadness, trauma, and loss. Wisdom is the balance that comes with perspective showing beginnings and endings, full circles, and fearful beauty of birth and death. Wisdom is nothing I would wish on anyone. For those who have reached its sun and shadows I am most grateful when they share bits of what they have come to know, but it is nothing for which I could ever ask. It is too personal. It is a gift. This is getting ridiculous. You can read it for yourself, here, but basically Governor Jan Brewer seemed to step over some political/religioius boundaries when in today's replacement statement for the State of the State address she said, "With our faith and our courage tightly in place, we will step forward from this Chamber, dedicated to the Lord's work -- continuing our service to the public." Arizona is run by right wing corporate money and has over-representation in its legislature by Christian and Mormon fundamentalists, most of us know that, but essentially charging the legislature to leave the legislative chambers and go out and do the work of a feudal concept of a male diety is way, way over the top. Being over the top is nothing new to Brewer. She and her ilk seem to want to rule and not govern. I don't want any elected official to do the Lord's work, I want them to do what they were elected to do, the people's work. I can ignore references to God by officials now and then, but this purely Christian religious charge to the legislature is offensive to me and probably is to others who think that the welfare of citizens beingplaced in the hands of people who believe in a feudal framing of the concept of a deity to be quite frightening. I write this for myself as much as for my friends who are readers and wondering what my take as a Tucsonan is on the horrors of yesterday. My heart aches. My eyes tear up on and off throughout the day. Could I have done more to decrease the culture of hate and violence that has torn our nation apart and killed members of my community? I have to say that, "Yes, I could have done more." No, no one killed was a personal friend of mine, but being an occasional participant in local political gatherings, being one of Gabby's District 8 constituents, and being an activist with a peace group who has made many trips to D.C. to participate in peace messaging to House and Senate members and office staff, I had met and interacted with several of the injured and killed. After I returned from Indiana in 2007, where I cared for my mother during the last months of her 92 year long life, I greatly decreased the frequency of my activist activities, that had began in 2003 and continued through early 2007, for several reasons. 1) I was tired, exhausted. 2) I had to find a job to pay off the significant debt I incurred caring for my mother because there is no good end of life health care in the U.S.
3) The escalation of violence in Tucson against peace activists by "counter demonstrators" continued during my absence and also during that time the Tucson Police Dept had stopped responding to requests for help from peace demonstrators outside weekly protests in front of a recruiting center when assaults by "counter demonstrators" occurred. These "counter demonstrators dressed in military uniformed and had personally threatened me previously. I was somewhat relieved when I found out I had to work on the morning when this vigil is held and this shames me. 4) I set off on a path to increase my inner peace and personal health. 5) I decided to focus on national level actions that spoke to me. 6) I selfishly felt the likelihood of personal injury to myself was much greater in Arizona than personal injury in the U.S. Capitol activism. Had I been more vocal, and more articulate, about the growing undercurrent in the atmosphere of hate and violence here in Tucson, that IS a real and palpable presence by the way, could I have nudged a thing or occurrence here or there that might have somehow changed something? I absolutely believe that it is no accident that this horrible attempted assassination, and the related murders and shootings, which so many on the left were afraid would happen, happened in Tucson. Many people in Tucson and across the country had voiced concern about just such a thing happening after images and speech suggesting violence became routine parts of political campaigns. Many feel that this horror happened here in the rabidly out of control Fundamentalist Mormon & Christian and Republican controlled state of Arizona because the atmosphere here helped a very disturbed young man feel it was acceptable to attempt to assassinate a Congresswoman. No, I don't feel personally responsible for any one thing, but I do feel there is some possibility that I could have done something more to help change the atmosphere; I know we all, each and every one of us, have impact on others far beyond what we will ever know. My favorite movie is It's a Wonderful Life, not only because I'm a sap, but because this story so beautifully shows the inadvertent and indirect, but significant, impact we not only have on those we love or interact with on a daily basis, but on those whose lives only tangentially brush our lives. I am upset that health care in Arizona has devolved to such a degree that individuals who are known to be potentially violent and dangerous are not getting needed mental health care and are able to buy weaponry and carry out murders and assassination attempts. I am grateful that the anti-education machine in the AZ government has been unable to completely strip the University of Arizona and the University Medical Center of funding for the only Trauma Center in Southern Arizona. Without this, many more people, including Gabby would have probably died. I am sickened that guns can be carried and concealed practically anywhere in the State of Arizona. I can't imagine what the upcoming redistricting in Arizona will do to the remaining and already irrationally fragmented political districts. The ability of liberal areas to have any meaningful self-governance have been politically silenced in the state as is evidenced by Tucson and other liberal Arizona enclaves division in egregious gerrymandering that will probably only get worse this year. I am quite upset by statements made by various elected officials in Arizona who have called for "moving on" from this tragedy within hours of the shooting, by Senator Kyl's statement that condemns Sheriff Dupnik rather than a statement decrying the violence. This reversion to political speak within hours of a mass murder in their jurisdictions unfortunately illustrates the disconnect these officials have from the real world. These leaders should apologize, at the very least, for such callous behavior when a city, state, and indeed, a nation are in mourning. I am upset that Boehner has chosen to focus on protecting House Members and their staff when half the dead were simple innocent constituent civilians--we don't just need to increase security. We need to increase civility. I unfortunately continue to be outraged by folks on the political right who say the left wanted this to happen for some perverse reason. By we progressives saying we were afraid something like this would happen when gunsights or target icons were placed over congressional districts in campaign materials and websites, or when Gabby's opponent had an automatic weapon shooting fest to remove Gabby from office does not mean that we wanted it to happen. As I think you can see by this ad image, the implications of this vitriolic language was over the top and could have even unconsciously influenced the gunman. The best thing the political right and or left can do right now is to apologize for anything they may have said or done, or that was said or done on their behalf, that in any way helped to create an atmosphere that allowed or incited this mass shooting and murder to happen. We all have to tone it down. But to deny responsibility is childish. We all create our world. We must all take responsibility for it. The people who were killed or injured were human, no more, no less. The atmosphere here in Tucson is tense and emotions are running very high due the shooting of 18 people, including Congresswoman Gabby Giffords this morning outside of a grocery. I've gotten calls from friends wanting to make sure I wasn't at the grocery store gathering where the shooting happened. I wasn't. I could have been. My husband could have been. He has spoken to Gabby outside Safeway Grocery stores before. Gabby has petted our mastiff and asked if he was a blue dog Democrat. My husband said, "Yes, he is a blue dog, but I am a yellow dog." A person who grew up next door to Jared Laughner told my daughter that Jared was relatively normal until High School when he reportedly suffered emotional problems and was rumored to have tried to harm himself more than once. The shooter was disturbed, no doubt about it, but whether he was politically motivated or not, the zeitgeist that allowed this to happen was partially created and constantly churned by Right Wing Hate Speech including Sarah Palin and Jesse Kelly. Read about Jesse Kelly's target practice aimed at Giffords here. Read about Sarah Palin's targeted list including Giffords here. Read about previous problems Giffords has had with violent hate speech and actions here. The powers that be here in Arizona have some explaining to do. Gun laws here allowed this slaughter of innocents to happen. Law enforcement's comfortable numbness to the wackos here who in many cases are their buddies helped this to happen. The unconscionable statements by the Govenor of Arizona and other Republican elected officials from Arizona today to "move on" from this event show the disconnect from reality that the right-wingers in this state have developed over the last few decades and last few years in particular. The shooting was this morning. The terribly disturbed partisanship and sense of right and wrong in this state is well evidenced by these statements. Move on? MOVE ON? How about investigate? How about mourn? How about draw together to learn and grow from a horrific event. But move on? How callous. This is the type of depersonalization or devaluation of those who disagree with you that must end. Gabby Giffords is my Congresswoman. I have disagreed with her on many issues, but I voted for her multiple times. I've been in her office in D.C. and spoken to her At public meetings with her. I have begged her to take the radical right threats in our district seriously. She is a moderate. I believe in the U.S. and know that Gabby does/did too. If this is not a wake up call for all of the USA, I don't know what is. The atmosphere in Tucson has been becoming more and more hate filled in how "liberals" are treated. Police in Tucson have refused to come to requests for help from anti-war protesters when they were being attacked by "counter-protesters." 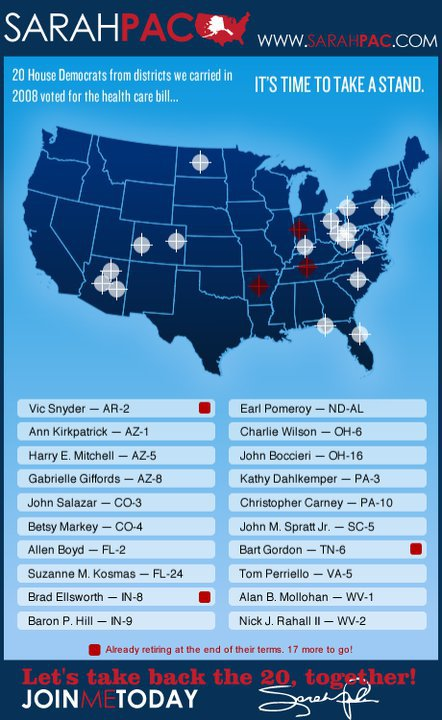 Gabby's opponent in the Nov '10 race called for violence. This is an open and concealed carry state. We in AZ have been taken over by right wing extremists. We have asked for help. We have been ignored. This is a proving ground for extremist right wing policies and practices, it has been ever since Goldwater. Will someone please open a Federal investigation about the infiltration of AZ legal and political structure by right wing terrorists? Please, do it for Gabby. Grijalva's office has been attacked previously. Both Raul and Gabby have had real and severe assault threats. My money is on the gunman being one of Jesse Kelly's supporters. Pray for Gabby, hold her in the light, envelope her in love!